So easy, so inexpensive, and pretty darn awesome! How can you not like it if if has garlic chicken gravy?!? I adapted this recipe from Melissa D'Arabian from the Food Network. It's a winner and I'll make it part of my regular rotation. 1Season Chicken liberally with Seasoned Salt - at least 30 minutes before cooking if you can. Salt does great things for poultry! 2Heat Olive Oil and Butter in a cast iron pan (something that can go in the oven). 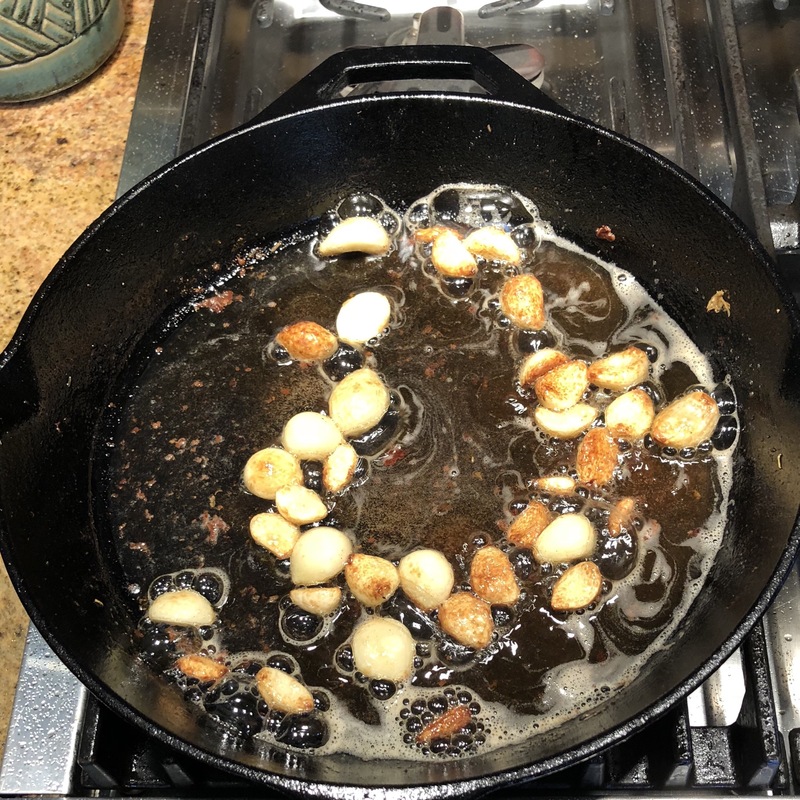 Sauté whole garlic cloves for 5-10 minutes, until they turn light brown. Remove and set aside. 3Place chicken, skin side down, for 5 minutes until golden brown on skin side. 5Baker for 30 minutes (at 350 degrees), or until meat temperature reaches 175. Remove from oven, and remove chicken and garlic from oil/butter/drippings. Place on serving dish. 6Heat oil/butter/drippings. Whisk in flour. Add stock and lemon juice. Add more stock if you want it. Now you have awesome garlic chicken gravy. 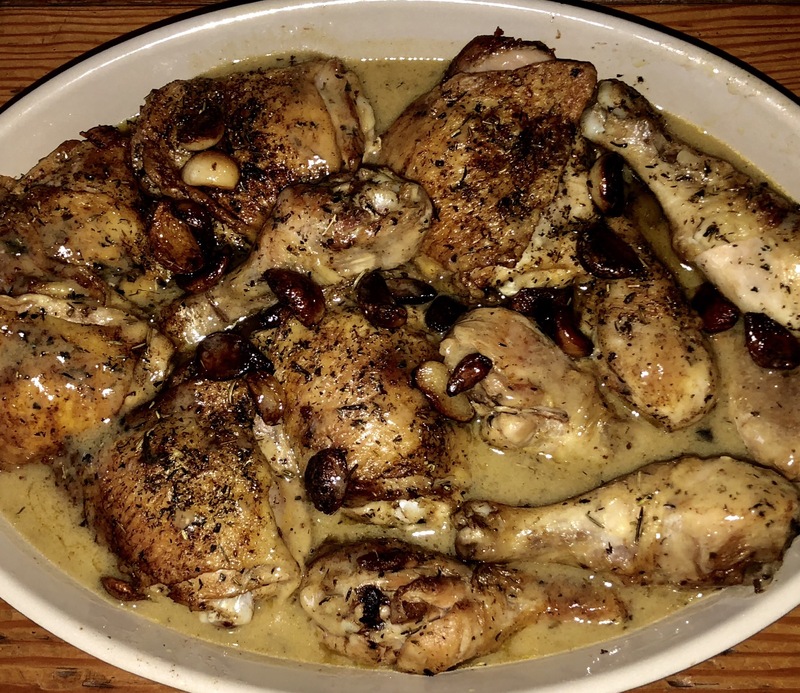 7Pour gravy over chicken and serve! Thanks Heather! More garlic is always better! Making it s prime number like 37 makes that even more more special. 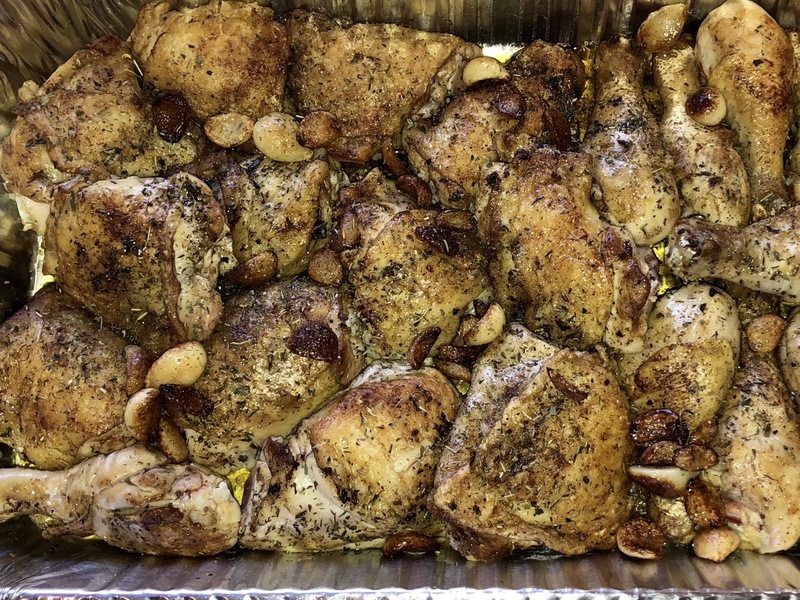 Per my husband, “Best chicken ever! !” And this despite my doubling the amount of garlic for this purported garlic hater (I counted 37 cloves). I wasn’t around to make the gravy, but the drippings alone drizzled over the thighs were plenty to keep the meat juicy and flavorful. I will keep this recipe in our permanent file, for sure.